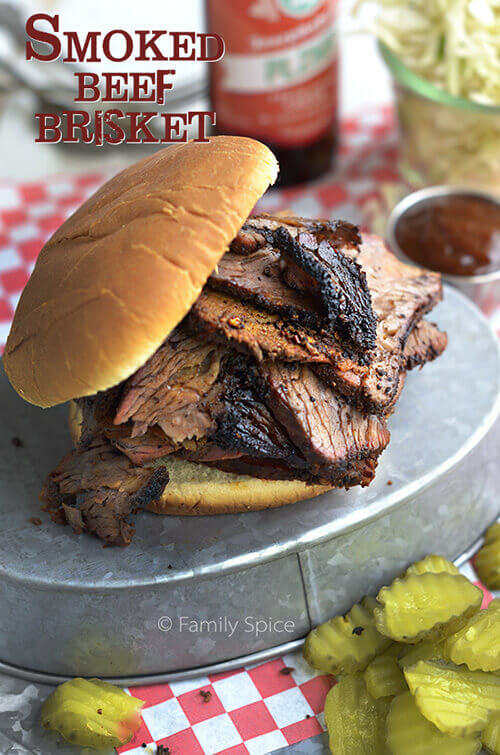 Tender Smoked Beef Brisket cooked low and slow is a lot easier to prepare than you think. It’s all about indirect heat, the proper setup, time and lots of patience! I never considered myself to be a very patient person. My husband is DEFINITELY not a patient person. Nothing like having kids to not only test your patience, but also teach you to chill and not agonize over the small stuff. Meditation can be one way to unwind. Of course, THAT never really worked for me. I can’t shut my mind off. Cooking and photography are two hobbies that relax me. And my husband’s latest hobby to relax with? Barbecuing. A few months ago, I wrote about our newest family member, our Big Steel Keg. My husband dives into his hobbies with every ounce of his being, and barbecuing is no exception. Lots of patience has been tested with cooking low and slow. After perfecting the smoked pork shoulder roast for pulled pork (of course it wasn’t ready to eat until 2am), we decided the next challenge would be the smoked beef brisket. Again, the key to smoked beef brisket is cooking your meat low and slow: low heat for hours and hours and hours. Smoked brisket is basically very easy to cook – if you are patient. If you rush and cook the meat too quickly, you will render a tough, horrid roast. Brisket is best cooked at 250ºF (low) for about 10 hours (sloooooowly) for a 7-pound brisket. But before you grill, you will need to season your brisket with a flavorful spice rub about 12-hours prior to setting your coals on fire. The rest of the work is making sure your temperature doesn’t go above or below 250ºF. This is the dance you dance with your coals and your vents. When smoking brisket in a standard grill, half of it is filled with coals and the other half contains an aluminum pan filled with a bit of water. The grill grate rests above that and your brisket is placed over the hot pan of water, not the coals, and cooked with indirect heat. If you have a Big Steel Keg, or any other grill similar to it, space is limited. Hubby created this technique to use indirect heat and smoke your brisket low and slow. At the very bottom of the keg you place the coals and wood chips. Above that you have the low level tray. Hubs placed a 1/2-inch piece of stainless steel to disperse the heat. Yes, we have lots of pieces of metal in our garage. Hubs used to be an Imagineer at Disney, as well as sculptor and an over all tool man. There are lots of crazy things in that garage of ours. You can find something like this at your local metal supply shop. Above the stainless steel plate we have the main grill grate where we placed this roasting pan (with rack) filled with 1/2-inch of water. It is in this baking pan and rack where we place the beloved and seasoned brisket. When you have a giant brisket, like a 14-pounder or more, you can cut it in half and place the second brisket on the top rack of your keg (not pictured in my diagram), above the baking pan containing the first brisket. While you are smoking your brisket, you need to keep it moist. We mopped ours with a beer-cider vinegar mixture every hour. Set a timer. A timer is your friend. Again, patience is the key to a tender and scrumptious smoked beef brisket. We followed the basic directions and recipe found here by my hubby’s other favorite obsession, The BBQ Pit Boys. Of course, we modified the recipe to our personal taste in spices and created our own indirect heat method to smoke the meat. Coals: We used approximately 1 chimney full of unlit coals with 1/2 a chimney full of lit coals. The Big Steel Keg does not waste coals, so we had plenty leftover after 10 hours of grilling. You might need to add more coals if your conventional grill drops below 250ºF in temperature. 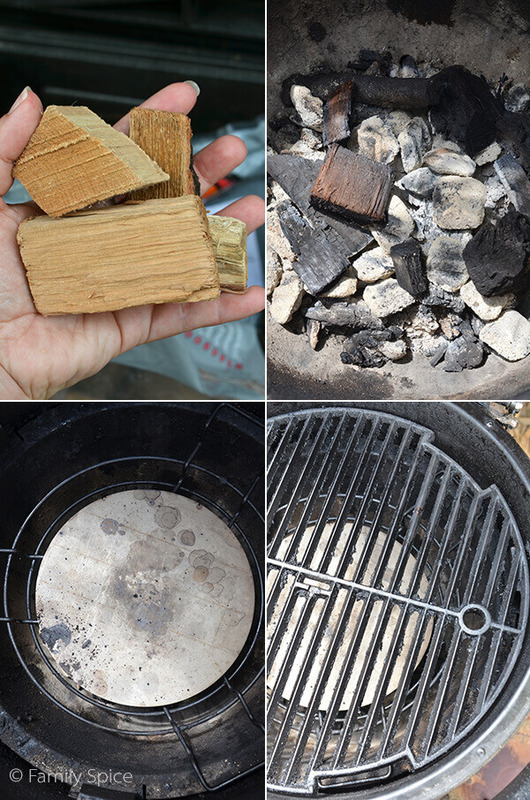 Wood Chunks: We used 3-4 chunks of hickory (similar to these) for smokiness and mixed them with the coals. Foil: After 8-hours of smoking the brisket in the roasting pan and when the internal temperature reaches 190ºF, we also wrapped it tightly in aluminum foil and returned it to the grill to cook for another 1 1/2-2 hours. The result? Mind-blowingly awesome brisket that is ridiculously tender, yet firm enough for slicing. If you like your smoked beef brisket even more tender, like falling apart tender, continue grilling for another hour or two. Trim fat cap on brisket, leaving 1/4-inch layer of fat. Remove any silver skin completely. Apply rub over the entire brisket. Place brisket on a baking sheet and keep in the refrigerator overnight, uncovered. 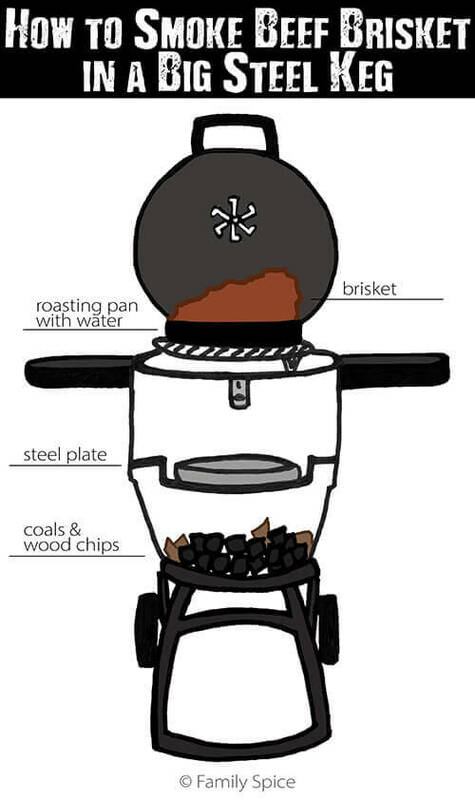 If using a charcoal grill, fill chimney full with natural mesquite lump charcoal and add to one side of the grill. Mix in half a chimney full of lit, hot briquettes with the non-lit briquettes. Add 3-4 chunks of hickory wood for smokey flavor. 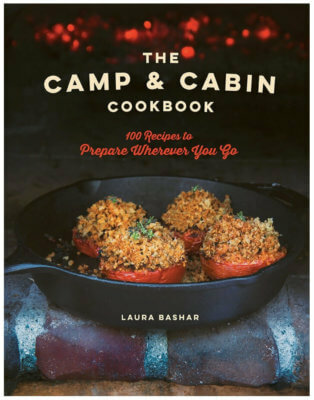 Next to the briquettes, in the other half of your grill place a drip pan or aluminum pan. Fill with 1/2-inch of water. Place grill rack over the charcoal and water pan. Using a thermometer, maintain grill heat at 250ºF. Place prepared brisket on the grill rack, over the water pan for indirect heat, fatty side up. Cover and begin cooking low and slow. Cook until internal temperature of the brisket is 190ºF, about 8-9 hours. Add more charcoal as needed to maintain 250ºF grill temperature. When brisket reaches 190ºF internal temperature, remove from grill and wrap tightly with heavy duty aluminum foil.Return foil-wrapped brisket to the grill and continue cooking for 1 1/2 to 2 hours more. Brisket should be moist and tender. Transfer to cutting board and let rest at least 30 minutes. Slice brisket against the grain, about 1/4-inch thick and serve immediately. Serving Suggestions: Serve with rolls for a sandwich or with mashed potatoes and cole slaw. Cooking Tips: Don't own a grill? You can also cook it in the oven. For smokey flavor add 1/2-1 teaspoon of hickory or mesquite powder to your rub. Cut brisket in two equal halves. Sear both sides of each brisket in a hot pan with 1 tablespoons of extra virgin olive oil. 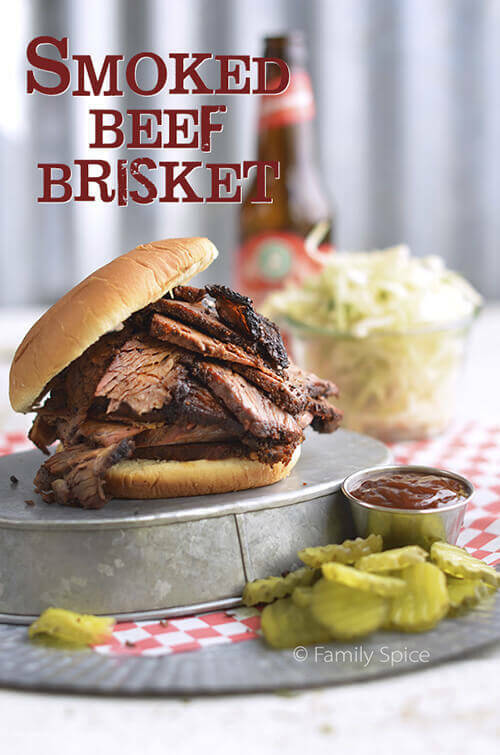 Wrap each seared brisket separately in foil, place on a baking sheet and cook in the oven at 50ºF until brisket reaches a temperature of 195º-205ºF, about 8-10 hours. You can also cut brisket in half and smoke the cuts of meat on your grill to cut cooking time, 1 1/2-2 hours per pound of meat. 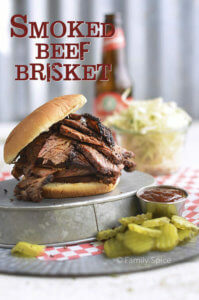 And, for everything you ever needed to know about Texas-style brisket, check out this article from AmazingRibs.com. Disclosure: This post contains affiliate links. All of the opinions I expressed here are my own. If I didn’t like it, I wouldn’t blog about it. Taking the time and care in preparing meat is so essential for a satisfactory result. This is a very informative article and especially a delicious one. Yum! I could really sink my teeth into that bad boy. It looks Ah-MAZING!